Exxon Mobil (XOM) is one of the largest oil companies in the world. Its roots could be traced to Standard Oil, which was broken into several separate companies in 1911. Eventually two of those companies merged in 1999 to form Exxon Mobil. The company has benefited tremendously over the past decade, as the price of oil has increased over 8 times since 1999. This dividend aristocrat has paid dividends since 1911 and has consistently raised them for 28 years in a row. Despite the fact that many believe so called alternative energy sources would replace fossil fuels in the future, oil and gas would still be around at least for the next few decades. As a result investing in oil companies makes sense for income investors. Check my analysis of the stock. The largest oil companies in the world include Exxon Mobil (XOM), Royal Dutch (RDS-B), Chevron (CVX), Total (TOT), Conoco Phillips( COP), and British Petroleum (BP). 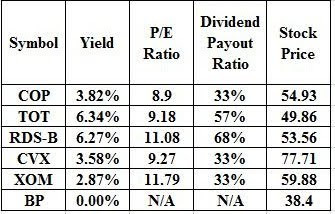 Of all oil companies, Exxon Mobil has the lowest yield and one of the lowest dividend payouts. BP had a higher dividend payout and a higher dividend yield before it cut dividends this year. Exxon seems to be plowing most of its earnings into stock buybacks. Historically share buybacks have not been one of the smartest ways for management to allocate cash, as most buybacks occur when the price of the underlying is at its highest. For example General Electric (GE) repurchased stock worth billions of dollars when the price was above $30, only to sell it back at $22 during the global financial crisis of 2007-2009. Exxon has been raising dividends, but the disproportionate amount of share buybacks to dividends suggests that management is not certain about the future profitability of the company. If they believed that oil prices would stay higher over the next few decades, this would mean that earnings per share could only go higher from here. This would support a higher dividend than the one we have today. Of course if oil prices plunge below $50 and stay there, then profitability would suffer and if dividends are too high, they might be cut. This could lead to angry shareholders and depressed stock price for some time. With buybacks however this could all be avoided, since they could be canceled at any time, without much publicity. ConocoPhillips operates as an integrated energy company worldwide. It operates through six segments: Exploration and Production (E&P), Midstream, Refining and Marketing (R&M), LUKOIL Investment, Chemicals, and Emerging Businesses. ConocoPhillips has raised dividends for ten years in a row. Currently the company is trading at a P/E of 8.90 and yields 4%.